Happy winter everyone. Welcome to the first #MonaLog – a PolitiChick Insider into the 2016 Presidential race. 6 million viewers tuned in to Saturday’s ABC “I Apologize” Democratic debate that was held in Manchester, New Hampshire. The two-and-a-half hour debate began with the first question to Senator Bernie Sanders in regards to the latest controversy over #Datagate where his campaign aide breached into Hillary’s campaign voter data. ABC moderator David Muir asked Sanders to apologize to Hillary. 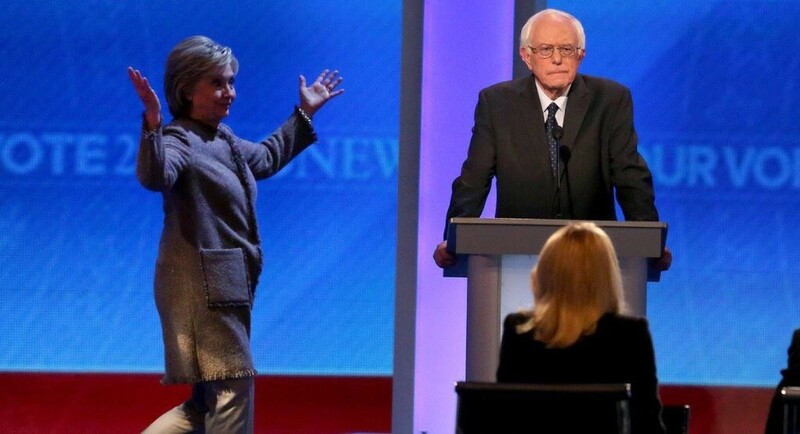 “Yes, I’m sorry,” Bernie replied right away in a bow-down-to-the-master type of move, in which Hillary executed the famous line Bernie used in the first debate that saved her from answering questions about her emails. “We should move on because I don’t think the American people are all that interested in this,” Hillary said. After the apology, both Hillary and Bernie began to spar on numerous issues that showed ideological differences amongst both. On Taxes– Hillary promised not to raise any taxes on the middle class only the “wealthy” while Sanders proposes to impose a 0.2% payroll tax on all households not just top earners to help cover his paid family leave program. On Libya- Sanders delivered the biggest knockout against Clinton when he brought up her disastrous plan during her tenure as Secretary of State of ousting Libya dictator Moammar Gadhafi that created a vacuum for ISIS rise in Libya. He pointed out the push for regime change in Syria by ousting Assad is “too aggressive without knowing what the unintended consequences might be.” Hillary fired back Sanders attack on Gadhafi’s removal stated he supported a congressional resolution for ousting the Libya dictator. On ISIS- Just like the Republican debate earlier the week where two leading candidates differ on a combative plan to defeat ISIS, the two leading Democrats are also on the same boat. In one corner there is Senator Marco Rubio and Hillary whose ideas are hawkish of expanding air strikes, arming moderate rebels with a potential use of ground troops and to go after Assad, while the other side of Senator Ted Cruz and Sanders are less militaristic, non-interventionist who believe U.S. military power should be focused narrowly on protecting U.S. interests and ignore Assad. After the first commercial break, ABC broadcast returned to show only two candidates on stage – Bernie and O’Malley. Where in the world (Saint Anselm College) is Hillary Clinton? Much of the debate attention shifted to a candidate who wasn’t on the stage – GOP front-runner Donald Trump. Trump name was invoked nine times during the Saturday night’s event, mostly from Hillary who seemed more focused on the general election against Trump despite the fact Sanders is leading in New Hampshire. During the debate, Hillary repeatedly called out on Trump rhetoric against Muslim but went to far with one line. Hillary comment during Saturday’s debate of the U.S. is “where we need to be” in the fight against ISIS, the rising health care premium costs in Obamacare are “glitches,” and lying about videos ISIS use of Trump to recruit radicals are keepsake clipping gift-wrapped for Republicans to use against her in 2016. Merry Christmas GOP! Cruz released a new Christmas ad that has broke the Internet over the weekend. The ad only featured in Iowa during the weekend’s “Saturday Night Live” show features his wife Heidi reading Christmas stories to their two daughters. “In the spirit of the upcoming holiday we are excited to bring a Cruz family Christmas into the homes of SNL viewers in Iowa,” the Cruz campaign told IJ Review. The Christmas-themed parody mirrors the comedic SNL format sketch. “Timeless Christmas classics” stories read to his daughters are “How ObamaCare Stole Christmas,” “The Grinch who Lost her Emails,” a story that pokes fun at Hillary Clinton. Watch the ad HERE on PolitiChicks. In an interview on CNN’s ‘State of The Union’ Sunday edition with Jake Tapper, Paul stated that Cruz should admit he changed his mind “that he used to be for legalization but he is not anymore.” He added that during the 2013 controversial Gang of Eight immigration bill, Cruz wanted to give the 11 million undocumented legal statuses but not grant them full citizenship.